This photograph, taken sometime in 1895, was submitted by the great grand-daughter of the woman standing on the right, Rebecca Cox Brown. The people in the picture (from left to right) are Herbert Wells, Blanche Brown Wells, Belle Victoria Wells (about 1 to 1-1/2 years old), Rebecca Cox Brown, and seated in front, Floyd Wells. Tax records show that in 1909, the house belonged to Rebecca Brown. 1912 tax records show the house belonging to Horace D. Brown, Rebecca's son, and was listed simply as the "Brown's Place". Helen Fox, the Bristol Historian, remembers passing this house on her way to school as a little girl. The house had a basement kitchen and was a design that was unique to the Bristol area. 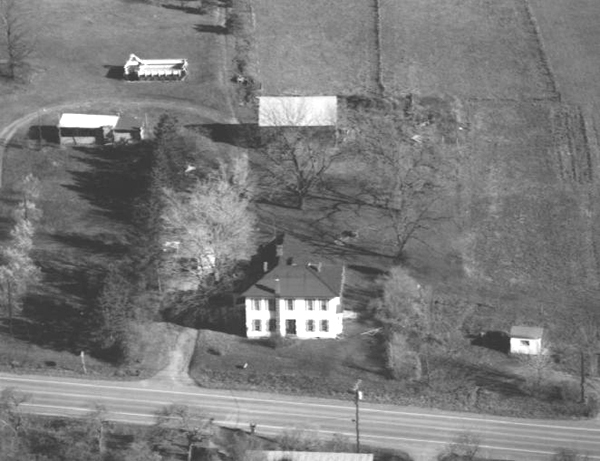 Sometime in the 1970's, the house had to be destroyed in a "controlled burn" by the Fire Department, because the people who owned the house had totally destroyed it. The stone retaining wall is all that is all that is remaining to remind us of the original house. In 1806, Rufus Whitmarsh came from Dighton and settled on lot #17. In 1819 he built the main part of the house that is at 5090 Route #64. Whitmarsh held the office of Justice of the Peace from 1810 until his death in 1831 at the age of sixty years. Situated behind the house is Randall Gully, named for a later resident of the farm, Norman W. Randall. In the center of Randall Gully is a waterfalls that has a vertical drop in excess of eighty feet and vertical rock walls that extend at least an equal amount further upward. 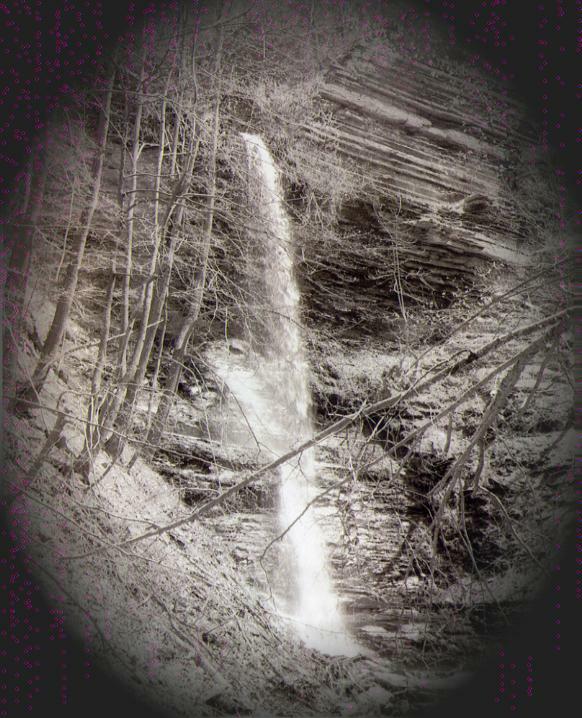 By 1876, this falls and ravine had became a favorite resort for parties in search of pleasure. Also near that area, early on, was an indian encampment. Over the years, The farm has been used to grow hops and fruit as well as for raising sheep. There is also some evidence remaining of maple syrup production and logging operations. On the other side of Route 64 was a rather large apple orchard which now has been reduced to only a half dozen trees. Many of the barns and other outbuildings have disappeared or have been substantially modified, but the main part of the house is almost untouched with the exception of some additions. At some point a large gravel pit was mined. One might assume that the gravel had been used on Route #64 for maintenance and construction. There are three dug wells on the property including one that is part way up the hill far away from any sign of farming use. The purpose of this well is a bit of a mystery because it is located a long way from any practical use. An old road of an unknown age winds its way to the top of the hill and into what was at one time a fairly large field. Along the entire southern border of the farm ran a single strand electric line from the base of the hill to the Dugway Road ending near the property of John Lovetro. Apparently this was one of the early methods of getting electricity up to residents on that road. Inside the main portion of the barn, which has since been torn down, the names and initials of the Allen family had been carved with the date of 1915. One beech tree on the hill also has the initials of Ruby Allen still visible. Many different families have occupied the farm since Rufus Whitmarsh first established it. Some of the names are: Randall, Allen, Gilder, Docteur, Joslyn. There have undoubtedly been others. Today the 105 acre farm has been split into five different properties. The character of the land has been altered since the time whitmarsh first settle there. Ponds have been added, land that was cleared for farming has gone back to forest, and more buildings and residences have been added. Over time, Mud Creek has silted in from erosion due to extensive logging and farming and has consumed some of the land with a large swamp and the annual spring flooding. The character and grandeur of the Whitmarsh house has remained and it is a building of great memories and history in our town. 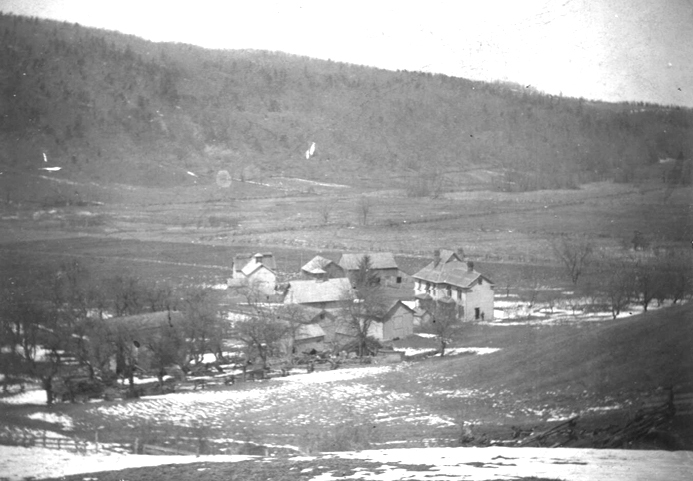 The Seymour W. Case homestead looks down Bristol Valley from its lofty hill. It has stood there since 1828 and generation after generation has watched the forward progress of the town. Seymour W. Case was the eleventh child of Jonathan Joy Case, the pioneer and his wife Lucy Simmons Case. They had 14 children in all, 13 of whom grew to maturity. Horace B. Case was Seymour Case’s son and Benjamin Case who resides on the farm today, was Horace B.’s son. 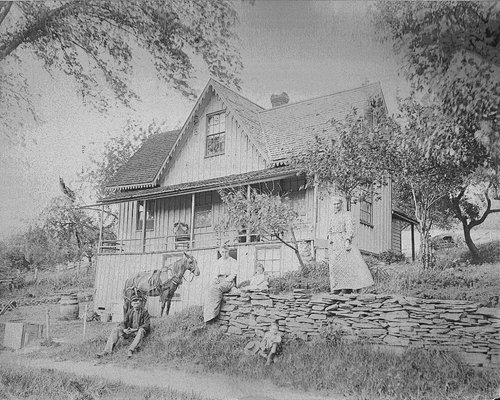 Living in the homestead with Benjamin Case Are his daughter, Mrs. Elizabeth Case Morse, his son-in-law, Kenneth Morse and their eight year old daughter, Lucinda. Thus five generations have resided on the farm. The Cases are a strong family both in numbers and in genealogy. 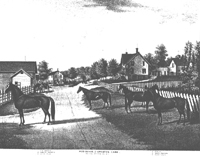 Jonathan Joy Case came into the county in 1800, walking the entire distance, it is said from Rehobeth, Massachusetts. He staked out a farm and returned to his New England home. The following spring, he and his wife and five children made the trip back to Ontario County. The records say that Jonathan Case had a crop of wheat and turnips that first year. 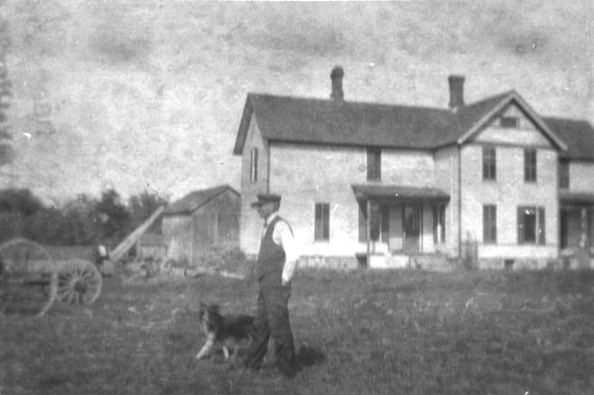 The original farm was about a mile west of theSeymour Case homestead. It is the Leon Holcomb farm today and the house has been completely remodeled. 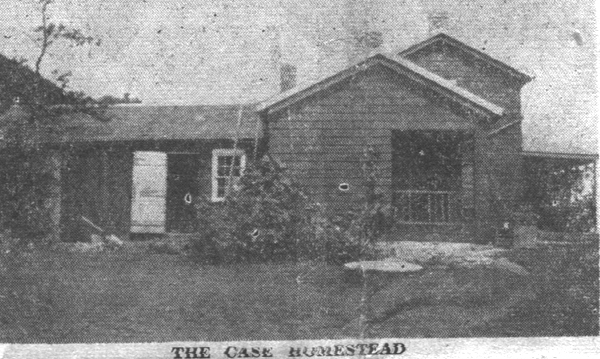 The Cases were not the original builders of the Seymour Case homestead. Captain Cole, another of Bristol’s pioneers, erected the house and probably lived in it briefly in the 1830’s. then he and his family migrated to Michigan. The family records are somewhat confusing on the exact date that Seymour Case came into posession of the homestead, but it was probably about 1840. Horace B. Case was born there in 1846 and his parents (Seymore Case married Caroline Gregg in 1837) had resided there for several years before that. Horace B. was their fifth child. 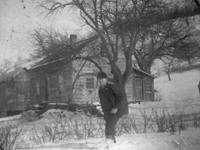 Seymour Case taught school for a few years in the northern section of town and it is believed that he and his brother, Sebra Case and family lived in the house together. One of Sebra’s children, an infant, was buried on the lawn of the home. Seymour Case was Bristol Correspondent for the Ontario County Times in the 1850’s and 1860’s. He also sent notes to, it is said, to Horace Greely’s New York Tribune. The Cases have been sturdy folk. They were Democrats in an area which became predominantly Republican. They were Universalists in a pioneer day when identification with that church meant swimming against the normal religious stream. 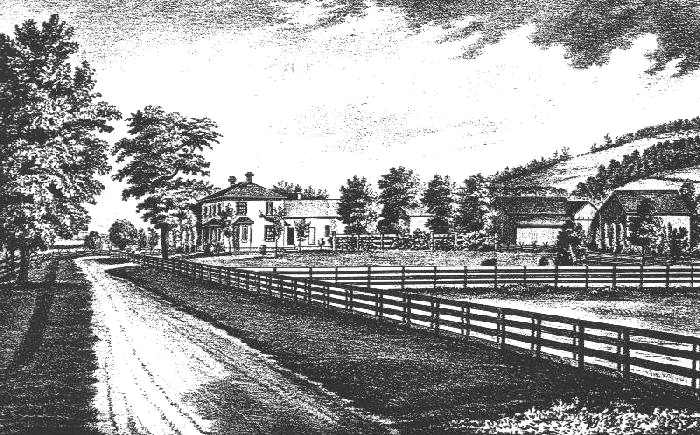 It is recorded that one of the family, William Case, voted for Lincoln in 1860 and forsook Universalism for the Methodist church in the valley, thereby alienating himself from the rest of the clan.Seymour Case and after him Horace Case never failed to walk the three miles to the Universalist church on Baptist Hill. Today in the Evergreen cemetery behind the church can be seen the graves of Jonathan Joy Case, his wife: Seymour and Sebra Case and their families, and Horace case and many other members of the family. The original Seymore Case farm had only been 45 acres, but this has been expanded by purchase until today Mr. and Mrs. Morse farm is about 300 acres. Wheat and corn were the big crops in an earlier day. Horace Case had a flock of 80 to 100 head of sheep and took them down to Elisha Goodings at Vincent for slaughter. Sheep, however, gradually faded out of the picture here as in other places in Bristol. Today, Mr. and Mrs. Morse have a fine herd of Brown Swiss cattle. Benjamin Case is 76, a powerfully built, picturesque figure with his flowing beard. He was an only son. His mother, who was Elizabeth Reed, member of another strong Bristol line, died in 1876 when he was four. His father Horace B. Case died in march 1921 in his 75th year. Except for modernization, the homestead has not changed much with the years. Benjamin Case, like his father, has never lived anywhere else. No one knows the Bristol hills or the valley more intimately. The Autumn season with the changing leaves and the criso air, is his favorite time of the year. This is the seventh in a series of articles which this newspaper is presenting on century old farms in Ontario County. These are stories of the pioneers who came into this area and built homes which have come down through the years generation by generation. The Totman name is old and strong in the Bristol Valley. Some records appear to indicate that Thomas Totman, soldier of the revolution and resident of historic Deerfield in Massachusetts came into Bristol in the last decade of the eighteenth century. There is some confusion about his role in pioneer Bristol. While still a young man, he moved into the northern section of the state and died in Lorraine, Jefferson County in April 1815 at the premature age of 51. There are indisputable records, however, that Thomas Totman’s son, Samuel, was a Bristol pioneer. Samuel Totman was 25 when he married Miss Naomi McCartney in 1809. They had seven children. Their three sons moved into the West but their daughters remained in Bristol and were married. The descendants have lived in the county for generations. Samuel Totman died in 1826 of pneumonia. Ward Totman, next to the youngest of Thomas Totman’s ten children (he married Rachel Rice) came first into Bristol in 1820. The story is that he came from Lorraine in Jefferson County by ox cart with his widowed mother who was to visit relatives. Twenty years after in 1840 he returned to Bristol with his wife (Irene Joyner) and their three small children. They were enroute to Ohio to make their home. Coming down steep Muttonville hill –Vincent today- their wagon axle broke and they were seriously delayed. They stayed with Ward Totman’s brothers and sisters in the Bristol Valley. Why not remain instead of continuing on a risky journey westward? – they were asked. The result was that Ward Totman and his family changed their minds and settled down in Bristol. 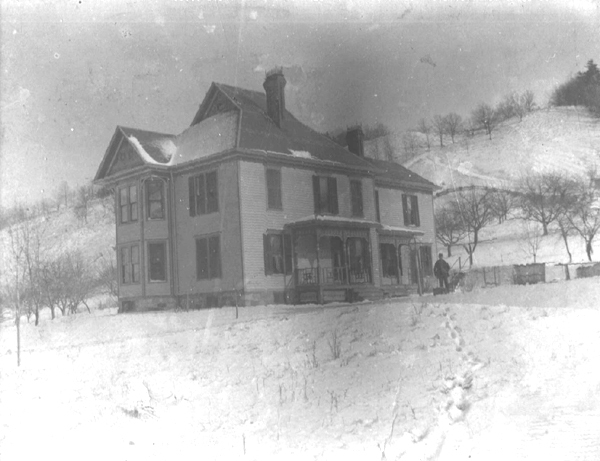 It was Ward Totman who established the present Totman homestead, just north of the old Congregational church and diagonally across the flats from the once famed burning spring. This is pioneer ground. Albert Codding built a log cabin close to the site. Somewhat later he tore down the log structure and raised a frame home. In 1845 Ward Totman moved his family into this house. A large elm stands close at hand which dates from the pioneer era and a patch of tiger lilies possibly planted by Mr. Codding marks the site. Ward Totman and his wife apparently had in mind leveling the old house and building anew but he renovated and reconstructed the front section and left the rear part in tact. This forms the back wing of the present house. Six generations have known the old home. Levi Totman, son of Ward and Irene Joyner Totman took over the old farm and expanded it to about 300 acres. Levi Totman raised stock and was keenly conscientious about his animals. The homestead has been kept carefully in modern years by Levi Totman’s daughter, Mrs. Grace Totman Corser, and her son-in-law and daughter Thomas G. Herendeen and Helen Corser Herendeen. Mr. and Mrs. Herendeen’s youngest daughter, Grace Korleen Herendeen is now the wife of Arthur T. Governale, who is a student at Sampson College. They have an eight month old son, John. Thus six generations have passed from Ward Totman who came into Bristol more than a century ago to today’s small John Governale. Levi Totman was a colorful figure. He is remembered vividly for his strong personality and his love of animals and skill in handling them. It is said that when he was four he drove a team of horses with a load of wheat to Rochester, following his father who handled the lead team. He was a student at old East Bloomfield Academy, served with the 1st New York Mounted Rifles in the Civil War, spent some time in the West and then came to Bristol. He was a devoted Methodist. Sundays without fail he drove the family to church. For years he led the choir. If his team of horses pulling the family surrey acted obstreptrous on the way to church he would wheel around and hitch them to the heavy lumber wagon. The family rode along on the rough planks and the horses behaved themselves. Levi Totman married three times – first in March 1868 to Zylphia Moore who died in February 1883: second to Julia Woolworth in November 1883 who died in November 1904, and third in January, 1907 to Mary Louise Love who is still living and who will be 79 on December 10 of this year. 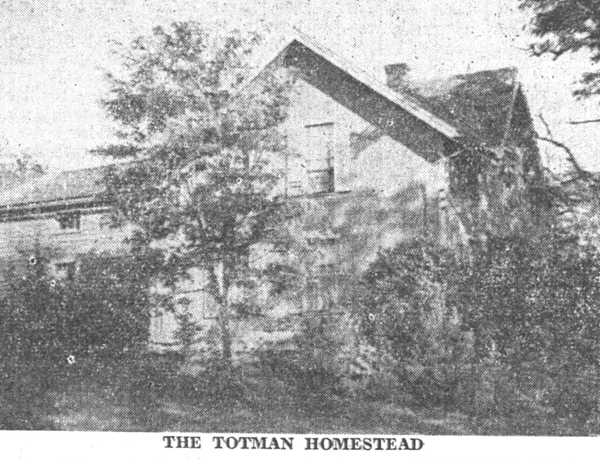 This story of the Totman Homestead is the eighth in the series which the Ontario County Journal presented on century old farms in Ontario County. These are stories of the pioneers who came into this area and built homes which have come down through the years generation by generation. For six generations members of the Fisher family have lived in their impressive home high on the hill overlooking the Bristol Valley road. Today it is the residence of L. Kenneth Bliss, grandson of Harlan M. Fisher, one of Bristol’s best known citizens for a half century. Almost 160 years ago Nathaniel Fisher, senior, settled on the hill after a laborious six weeks trip from Dighton, Massachusetts. Nathaniel Fisher was a man of 35 when he came into Bristol. This was in the late summer of 1791. Elnathan Gooding and he were the town’s earliest residents. Together they built the walls of a cabin high on the hill and then as chilly weather began to set in, Nathaniel Fisher started on his way back to Massachusetts. Elnathan Gooding remained during the winter. Like most of Ontario County’s pioneers, Nathaniel Fisher bought land at the Phelps and Gorham land office in Canandaigua. Because he was a Revolutionary soldier, he was able to purchase a half mile strip extending from Canandaigua Lake to the town of Richmond line at 10 cents an acre. The regular price was 14 cents. The family retained only about 200 acres, selling the eastern and western ends of their lands in early pioneers days. In the spring of 1792 Nathaniel Fisher brought his wife and children with him to the new land. They traveled in a two-wheeled ox cart and a mule. The journey up the Mohawk Valley was tedious and tiring. Nathan J. Fisher, Holcomb blacksmith, today has the heavy hickory seat on which the family rode. Nathaniel Fisher finished his cabin during the summer of 1792. Somewhat later it was enlarged into a double cabin and father, son and families resided there for generations. The elder couple always had the northern end. This was Fisher tradition. There were livingrooms and bedrooms on each side of the house and both families used a common hall and a great bake oven. Stories of life in the earlier generations have come through the years. Lighting the bake oven was always a task which must be started at dawn. Once the oven was hot the women of the household moved ahead with a cooking program which included, for example, two dozen or more pies. These were seasoned with brandy which with its preservative qualities allowed the mince and apple pies to be frozen and kept throughout the winter. Great pots of beans and shoulders of meat were prepared. Not far away was a fine Indian apple orchard and the Tallman Sweets were cooked each fall into applesauce which was mouthwatering. An older generation in Bristol will remember Alphonso Gooding Fisher, who was the grandson of Nathaniel Fisher Senior and son of Nathaniel Junior. He was born in 1816 and died in his 75th year in the early fall of 1891. He was a powerfully built man with square, straight shoulders and an ample beard that hung to his chest and was trimmed with care. Alphonso G. Fisher married Almeda Worrallo whose father was a ship captain on Lake Ontario and lost his life off Oswego in a storm. A sister, Lucretia married into the Case family, joining another old Bristol family. Alphonso and Almeda Fisher had two sons, Harlan M. and Edgar (Edgar was fifteen years older than Harlan). 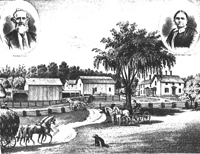 The farm was divided at Alphonso’s death. Harlan retained the eastern portion with the house on the hill and Edgar took the lower part which extended in to the valley and up Baptist Hill. This laid the basis for the family holdings of 104 acres today. Edgar’s portion has since been sold. Harlan Fisher was a strong figure in Bristol for years. He was six feet in height, well built and a man of studious personality. For 22 winters (winter was the time for schooling) he taught country school, returning to the farm for spring and summer work. He was an excise staff worker in his later years. He prepared the Fisher and Gooding genealogy which is highly respected for its detail and accuracy. Finally, he was a checker player of distinction. Almost no one in Bristol Valley ever beat Harlan Fisher at checkers. Harlan Fisher and his wife, Helen Louise Phillips Fisher, had six children, two sons and four daughters. Mrs. Fisher was the grand-daughter of Elnathan Gooding thereby bringing together a tie that was formed in the first fringe of Bristol Valley development. Harlan M. Fisher died in 1928 at the age of 78. He survived his wife by 27 years. Both are buried today in Bristol’s Evergreen Cemetery where so many members of the family lie. Their second child is today Mrs. Lester P. Bliss. Mr. Bliss is town of Canandaigua collector. Their eldest son is L. Kenneth Bliss who now resides in the family homestead. Mr. and Mrs. Bliss have four other children – Mrs. John Purdy (Helen Bliss), RD Canandaigua; Mrs. Stuart Purdy (Ruth Bliss), RD Canandaigua; Harlan B. Bliss RD Canandaigua and Alton Gooding Bliss, who resides in Illinois. Except for modernization the house has not changed greatly with the years. One of the great oaks which stood for generations is now gone but the other has survived. Harlan M. Fisher had a favorite story which concerned the night he and his father shot a large panther from one of the branches of this lofty oak. Such was life many years ago. 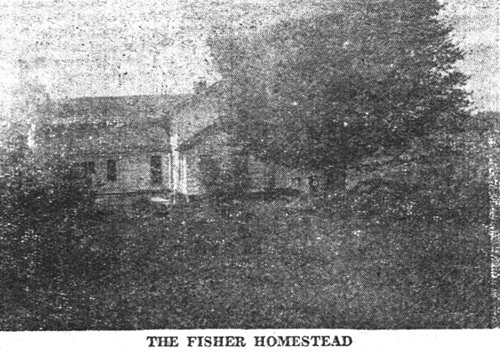 This is another in a series of articles published by the Ontario County Journal in 1948 that featured old pioneering homesteads in Ontario County. This article has been re-typed exactly as it appeared in the Journal. Shown here are some of the Mark Case real estate holdings that at different times housed many other Case residents. 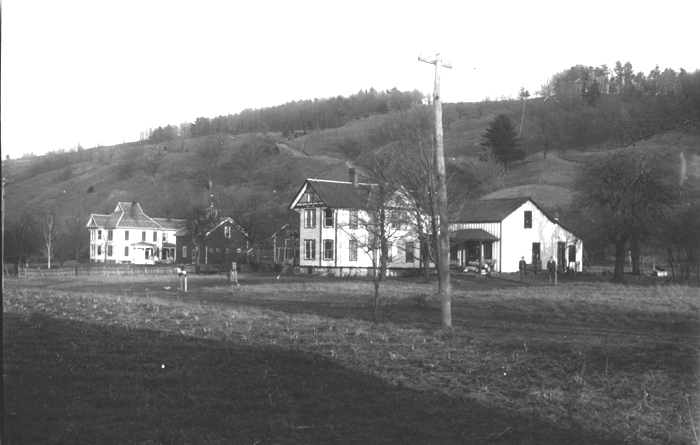 The 1874 Bristol map shows the location of these buildings in the southeastern portion of town along the Bristol Valley Road, today known as State Route #64. While not all of the outbuildings and barns remain today, the unique architecture of some of these homes make them easily recognizable. The building on the extreme right hand side was known as "Kahn's Store" in the 1950's. This was a general grocery store that also sold gasoline. Milton Kahn was the proprietor. One of the distinguishing features of this store was a unique carved devil's head, placed on the roof of the store which is today part of the historical holdings of the Town of Bristol. Although the date of this picture is unknown, note that the road was still unpaved when this picture was taken. The deforested condition of the hill behind these properties is also interesting as today, the hill is completely covered with mature trees. This property, also owned by Mark Case was his northmost holding in the area. It is not shown in the previous picture but is the next northern adjacent building. The individual standing in the picture is, so far, unidentified. This picture provides a view from behind the Case complex of farms and was taken from the hill looking out across the valley. People familiar with this area will be struck by the lack of swampland that covers much of land today. Mud creek, which is not obvious in this picture has changed greatly from the time of this picture. Having been changed by silting and beavers, the course of the creek takes a much more twisted and slow course through the property which has created vast amounts of swamp land over the years and overtaken what used to be tillable land. It is said that this grand ornate house was a wedding present to George and Edie Case. The house was recently restored and used as a bed and breakfast facility, but the exterior of the house has remained true to its original architectural features. In the front yard of this house, stood a couple of birch trees of huge girth that succumbed to a blight in the 1970's and had to be removed. The pictures here show them only as small trees, but before their demise they had reach great hieght and diameter. This was the home of Seymore and Minie Case. The picture was taken from the north side yard. The individual pictured here is unknown. The old Billings Case farm was on Footer Road near County Road #2.